Stevie Wonder. Sigh. If you told me I could only listen to music made by one artist for the rest of my life, I would choose Stevie Wonder without hesitation or regret. Heck, he's mostly what I listen to anyway! 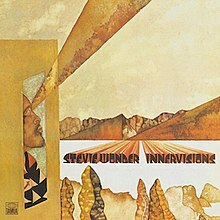 And if I had to pick one album, it would be Innervisions, one of the greatest collections of songs ever put on vinyl. Think about it: "Living for the City." "Higher Ground." "All in Love Is Fair." "Golden Lady." As the late-night commercials used to say, "and many more!" And every one of them written, produced and performed almost solely by Stevie Wonder. Genius. In Cusp, Karen discovers Stevie Wonder on WBLS, a New York soul station that in the '70s promoted its call letters as an acronym for Warmth, Beauty, Love and Sensitivity. She'd been unaware of the station, and the musical genre, until clued in by her new friend Mark. In Chapter 3, one of the first songs she hears on 'BLS is the haunting "Visions." Innervisions spawned three top 40 hits, including two that hit number 1 on the R&B charts. But "Visions" was an album cut, a special treat for those who bought the record, or heard it late at night on a well-programmed radio station. Records? Well-programmed radio stations? Just two reminders that The Cusp of Everything is a period piece.